You are currently browsing the category archive for the ‘Feature Articles’ category. 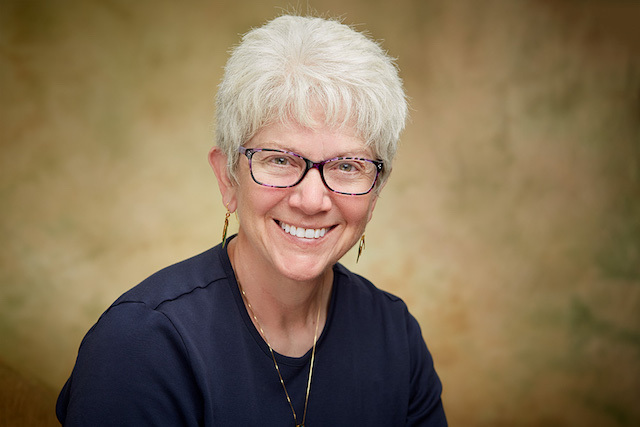 Melanie Campbell-Carter will be giving a presentation at the Natural History Institute entitled, “Scallywags, Gloryhounds, Visionaries and Conservationists: Stories from the Arader Collection” on March 21, 2019 at 7 pm (Arizona time). 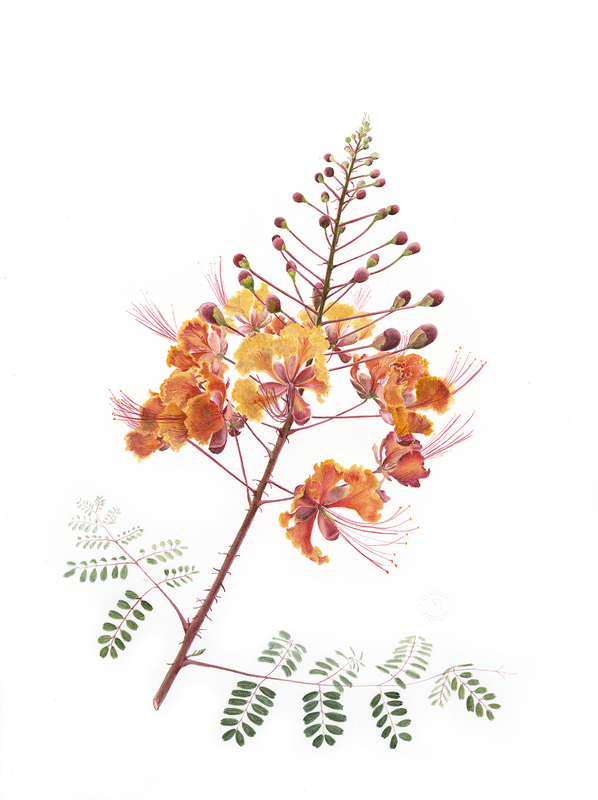 Images by Mark Catesby, one of the artists featured in the Josephine Michell Arader Natural History Print Collection. 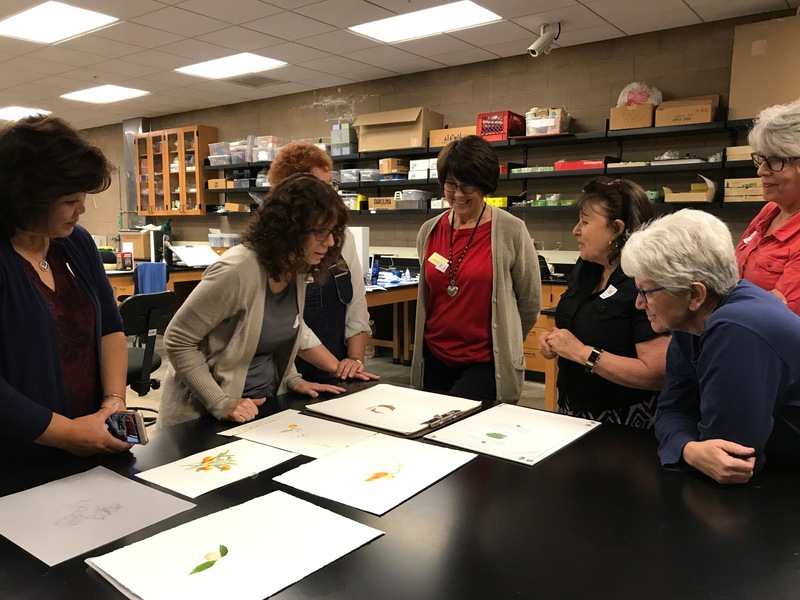 Melanie will share little-known histories about the fascinating people behind the Josephine Michell Arader Natural History Print Collection images currently on display in the Natural History Institute Art Gallery. 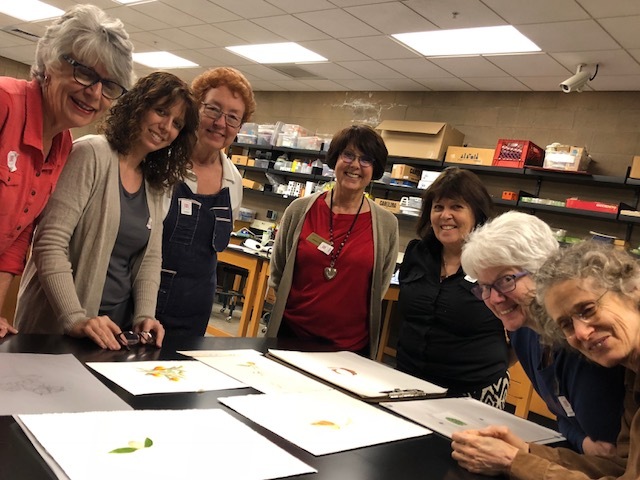 After retiring as a family practice physician in Texas, Melanie Campbell-Carter discovered her passion for botanical art and moved to southern California. 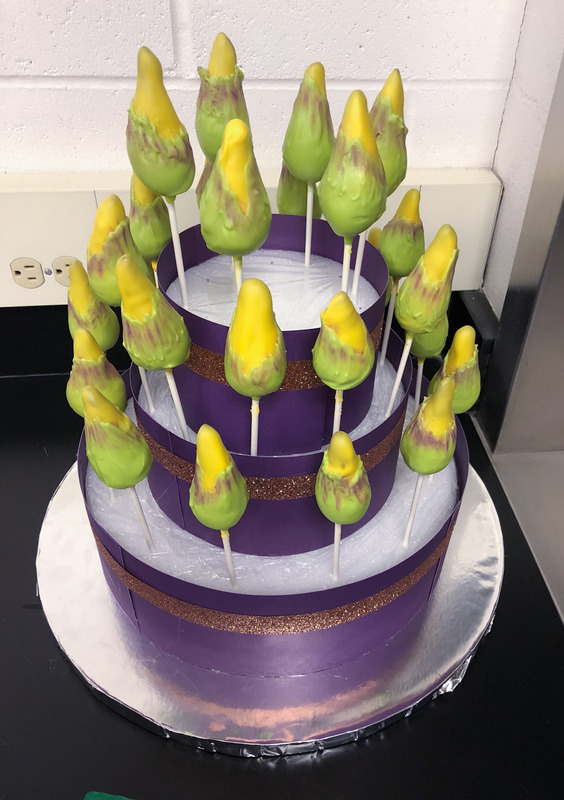 Still a BAGSC member, Melanie moved to Tucson, Arizona in 2017, where she quickly became enamored of the plants of the Sonoran Desert. Melanie’s art has been displayed in numerous exhibitions, including New York, San Francisco, Los Angeles, and St Petersburg, Russia to name a few. 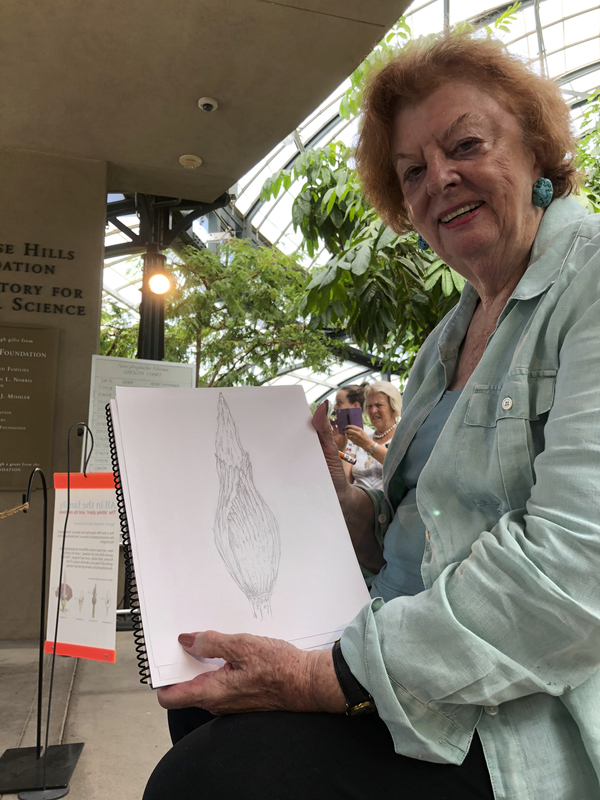 Her paintings are in permanent collections at the National Tropical Botanical Gardens in Kauai, Hawaii, and at The Huntington Library, Art Collections and Botanical Gardens, Brody Educational Center in San Marino, California. 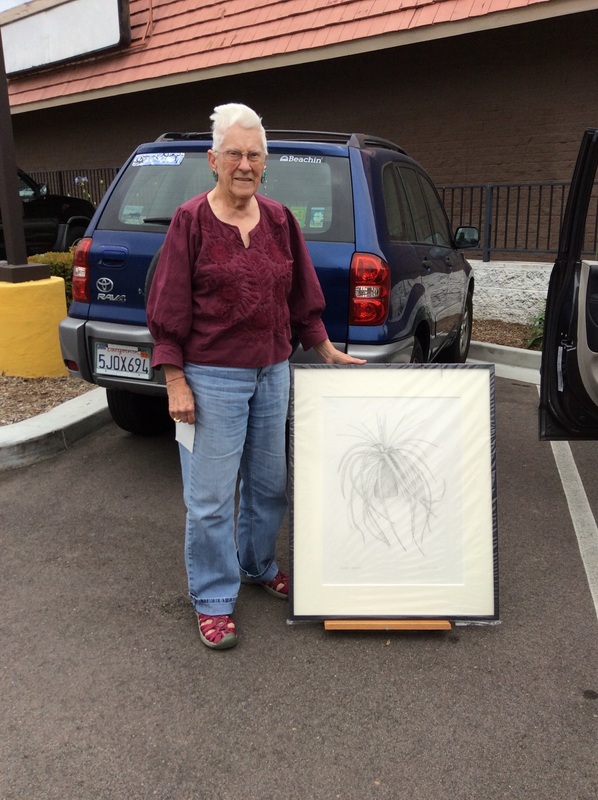 Leslie Walker delivering her Hechtia argentea to the World Bromeliad Conference. The painting is enclosed in a plastic bag. Photo by Robert Kopfstein, © 2018. 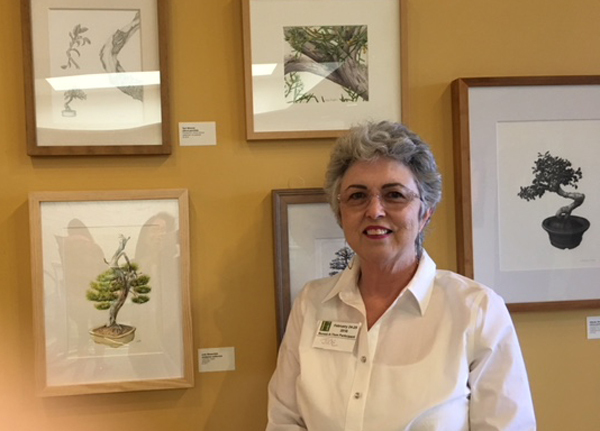 BAGSC member Leslie Walker delivered her commissioned graphite drawing of Hechtia argentea to be shown at the World Bromeliad Conference 2018. This year’s conference was held in San Diego, May 29 – June 3, 2018. 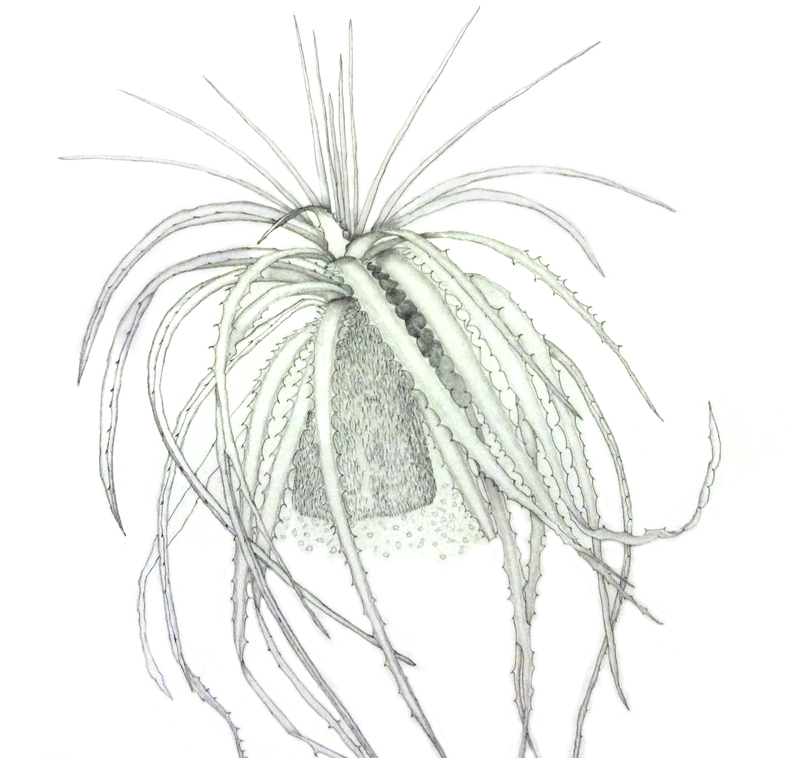 The plant specimen had many more leaves; the challenge of drawing the Hechtia was editing out which leaves to draw, in order to be both true to the plant and yet make it understandable to view. 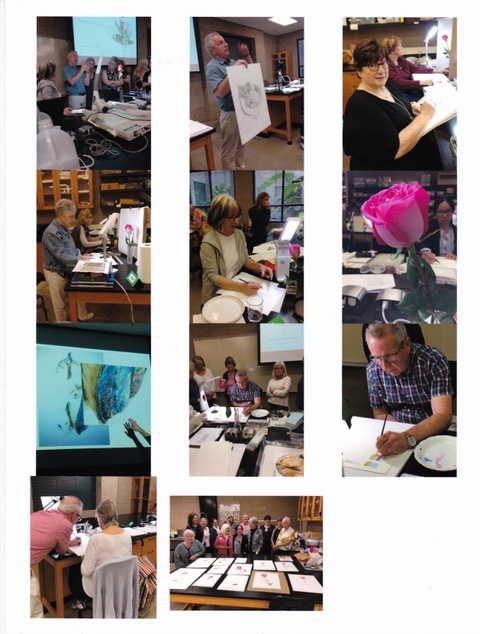 The artwork was on display during the World Bromeliad Conference. 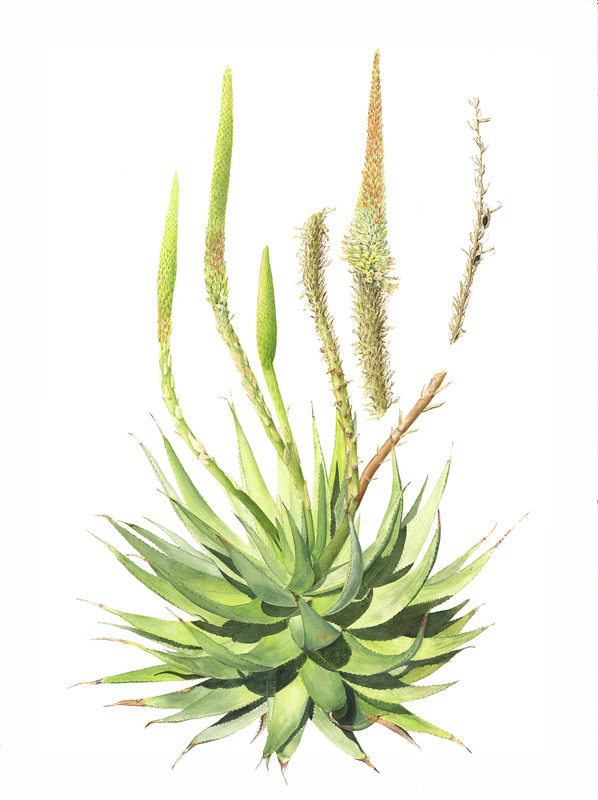 Hechtia argentea by Leslie Walker, © 2018. Partial image (cropped) of artwork, photo taken with an iPad. Please join The Arboretum library and other plant and garden aficionados for a beautiful evening celebrating the Arboretum Library. 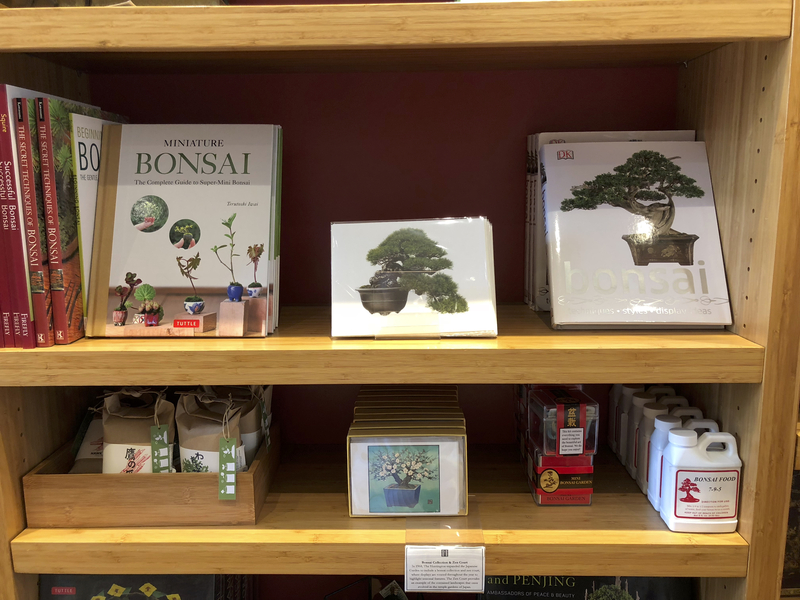 The Arboretum Library is distinct among libraries as a comprehensive and very special collection of more than 20,000 books on botany, botanical illustration, gardening, California native plants, landscape design, gardens around the world, agriculture, and more. 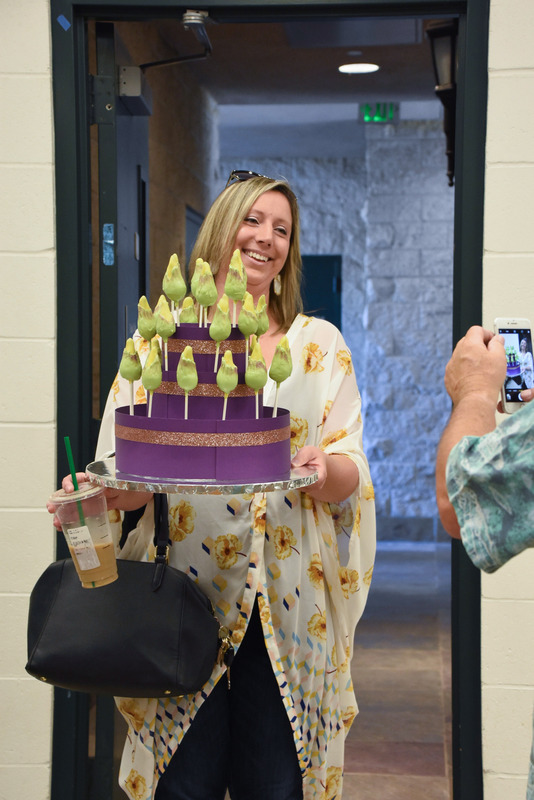 For one night only, there will be merriment in the Arboretum Library stacks, twilight music in the Arboretum, outside viewing of mid-century travel slides, and inside viewing of mid-century library landscape materials, various nerdy library things, a little nosh and a no host bar. 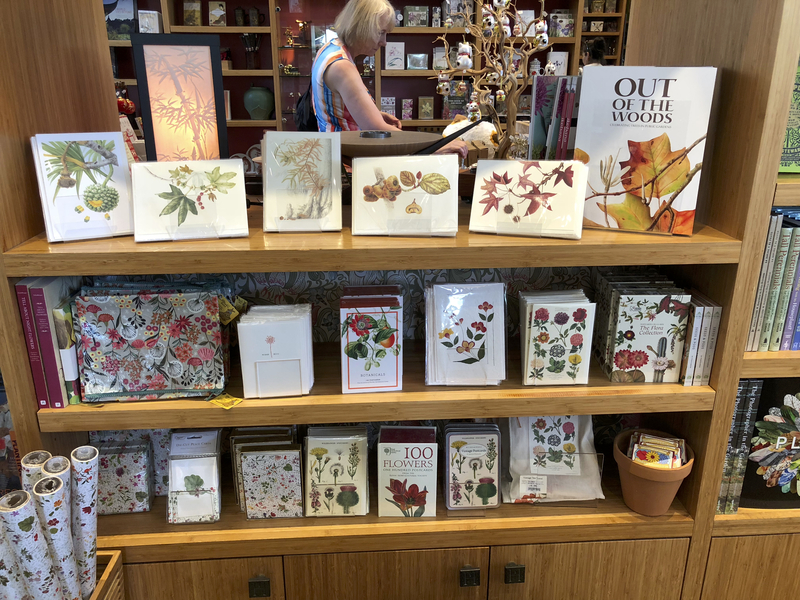 View a wonderful art exhibit, with personal artist tours of the exhibit “The naturalist’s desk: language and landscape” And of course a book sale too! Consider spending an evening with your fellow BAGSC colleagues supporting the Arboretum Library. 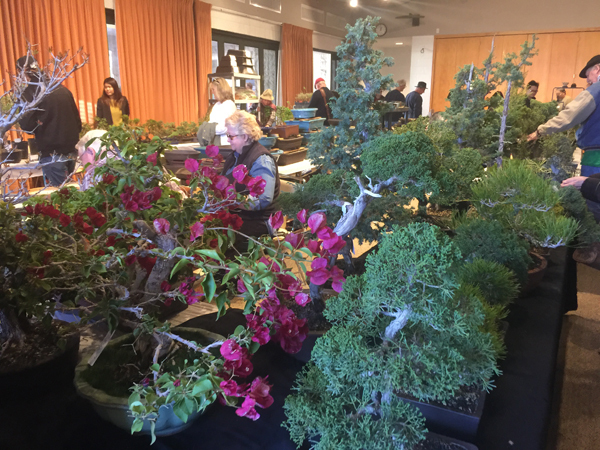 All proceeds from the event support Arboretum Library programs. For one night only, there will be revelry in the Arboretum Library stacks and music in the Arboretum twilight! Friday, May 4, 2017, 6:30 p.m.-9:00 p.m.
First chance to purchase at the used book sale. Specialty books ready for their new owners. Advanced Tickets: General Public $20, Members $15. Call 626-821-4623. 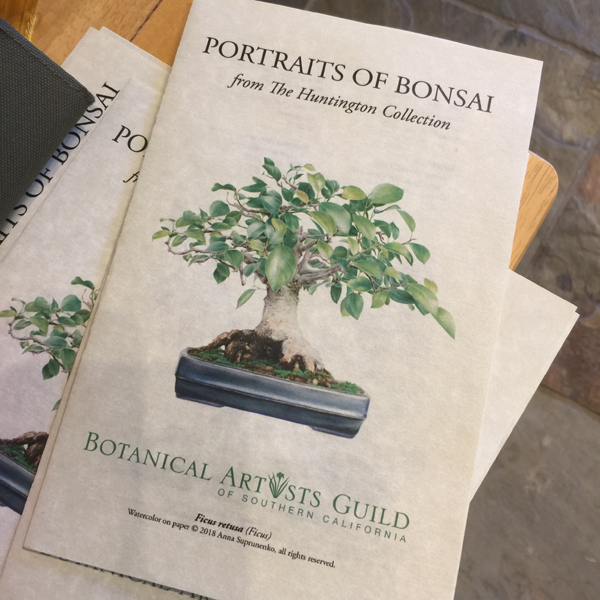 All plant, garden and landscape societies, all library organizations, and all botanic gardens and arboreta. Questions? Contact Susan Eubank, 626-821-3213. Etlingera elatior, aka Pink torch ginger. 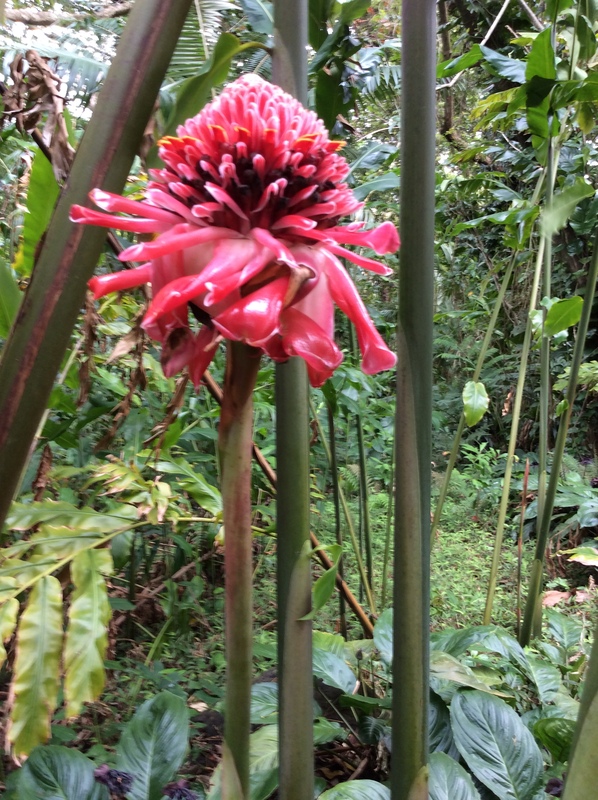 Waimea Valley Botanical Gardens, Ginger and Heliconia Gardens, North Shore, Oahu. HI. Photographer: Arillyn Moran-Lawrence, © 2017. 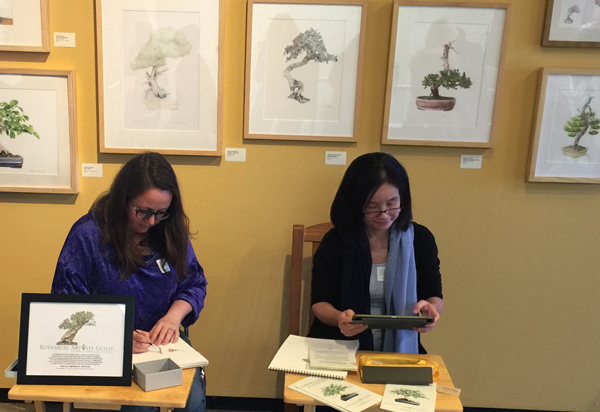 I began studying endangered plants in Hawaii, when the ASBA Exhibition Losing Paradise? was announced. I had three to four gardens I wanted to visit. 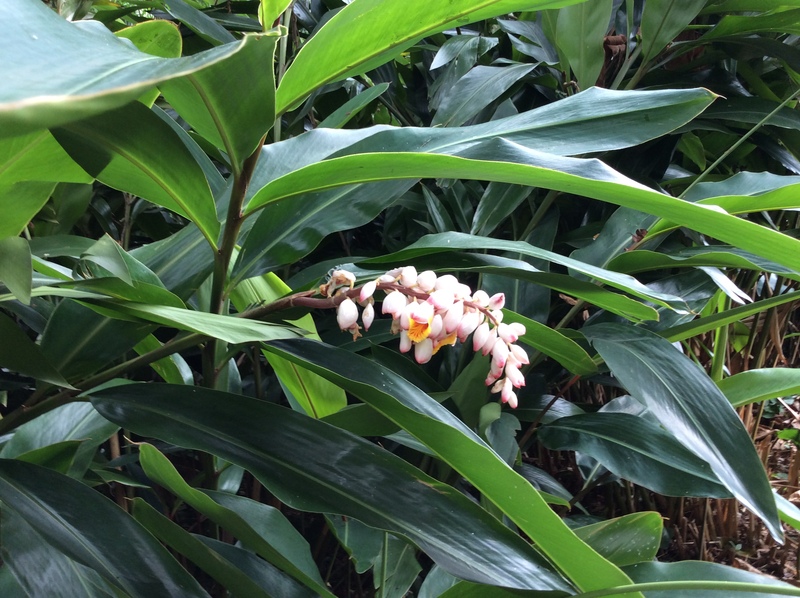 One was the Lyon Arboretum, on the South Shore of Oahu, in the Rain Forest; Waimea Gardens on the North Shore of Oahu; and, Koko Head to the east of Honolulu. Ho’omaluhia on the East side of Oahu did not have endangered plants so I did not consider that garden in my plan. I also did not consider the small garden in Wahiawa nor several other gardens in downtown Honolulu. 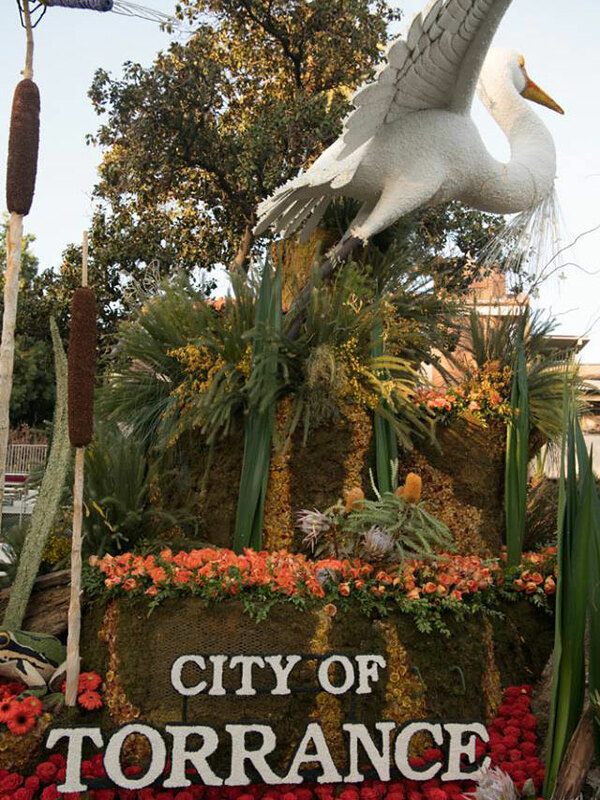 I focused on the three larger gardens. I called the three major gardens ahead of my visit and contacted knowledgeable people with whom I made appointments. 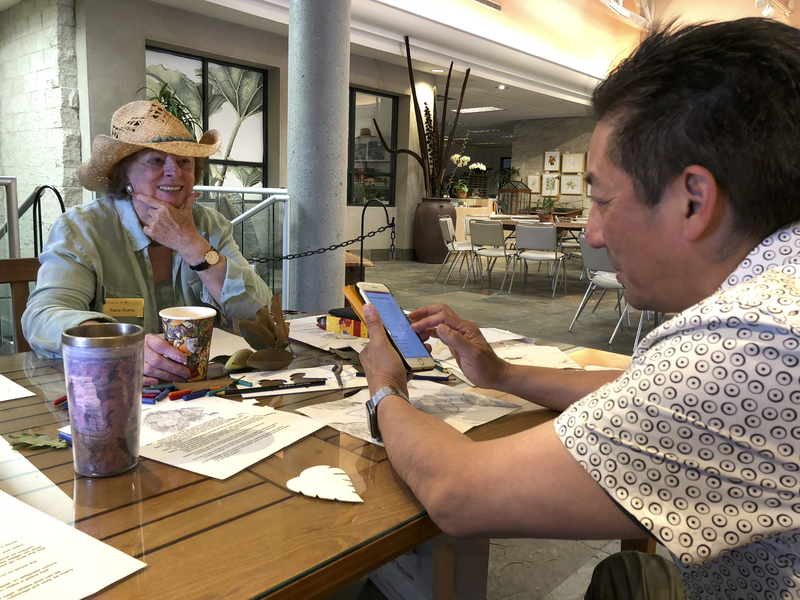 At the Lyon Arboretum I contacted Karen Shigematsu, Botanist. At Waimea I made an appointment with David Orr, Botanical Specialist. At Koko Head there was no botanist or specialist available. You are on your own with just the information on the plant labels in the specialized gardens. These are three different gardens with three different personalities. This is true of all gardens all over the world. You can visit each of these three and decide on which one best delivers what you are looking for. This garden is very large and stunning as you walk out the backdoor of the Administration Building. It is rugged, however. Mosquitos and bugs like to bite you. 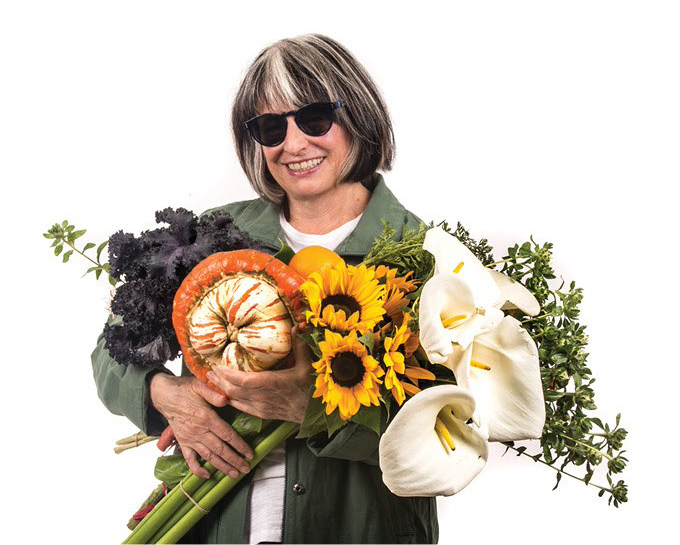 Karen Shigematsu first showed me the nursery and then introduced me to the garden. The first garden has numerous plants to choose from. 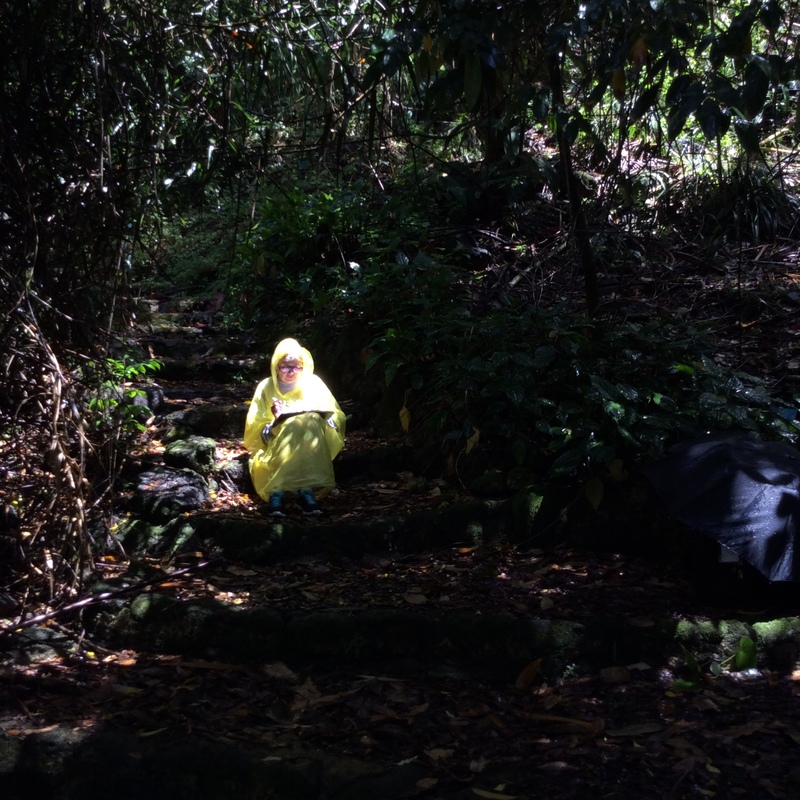 However, as you go deeper into the garden on the way to the falls you will find you need strong boots, a rain poncho, an umbrella and a map of the garden. Keep in mind that your cell phone may be blocked by the high mountains that surround the Lyon. 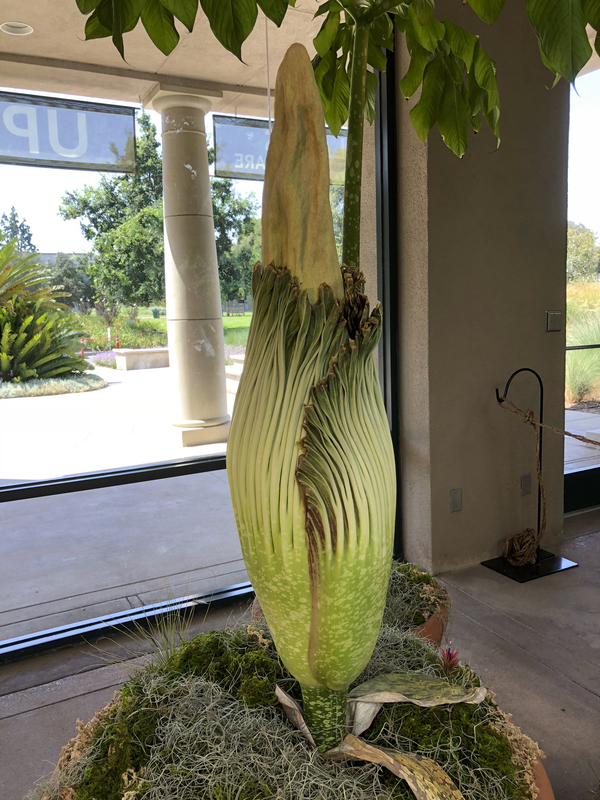 If you have health issues you may want to check with the Administration Staff on the ability to make it to the falls and visiting the gardens along the way. There is a less difficult path close in area, to which they will direct you. 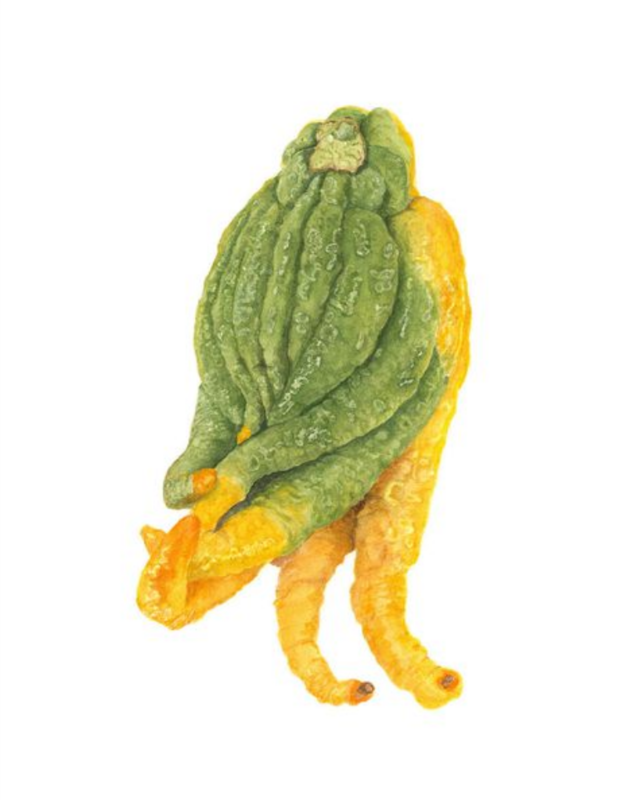 A back pack is the best way to carry items you will need to record plants of interest. Make it light as the trails are full of rocks and the heat or rain may wear you out. Rolling gear is only good in about a quarter of the Arboretum. There is no shuttle service, no food stands, and the toilets are in the Administration Building. You can buy t-shirts, books and more, in the Administration Building. Arillyn Moran-Lawrence working on Stelechocarpus burahol, aka the Keppel Tree, while sitting on the steps in the Waimea Valley Botanical Gardens, Malesia Gardens, North Shore, Oahu, HI. Photographer: Michael Tyau, © 2017. Waimea Gardens on the North Shore of Oahu is an example of the Perfect Garden. It has a retail shop, an outdoor restaurant, bathrooms, a shuttle to carry you to the waterfall for a swim, and gardens galore. All are scattered over this treasure of a garden on a paved trail with shuttles. The only problem is that the garden is in a valley and the cell phones do not work there. David Orr, Botanical Specialist met me with a golf cart so we could cover a large area. 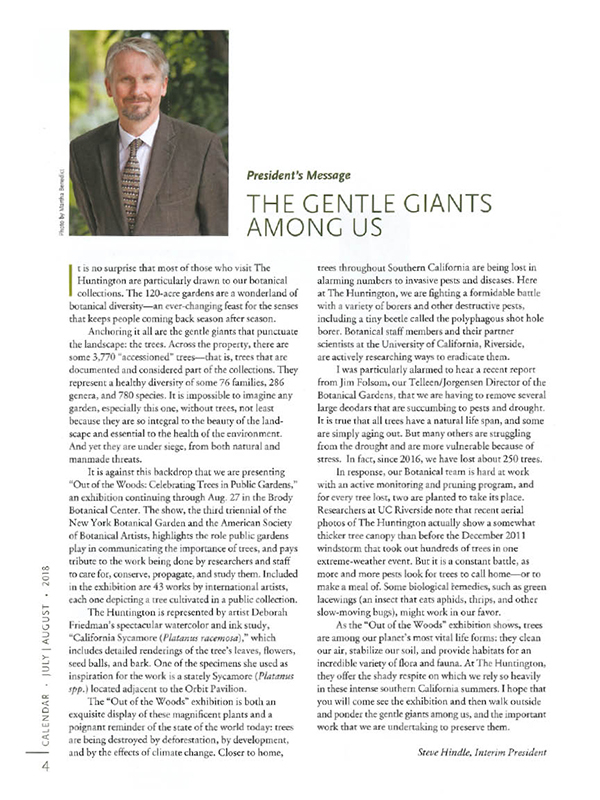 He explained a great deal about the endangered plants and why so many are on the Red Lists. Hawaii has the most endangered place in the world, including animals, birds, insects and plants. Ask if a guide is available to meet you on a special day, date and time. Carry bug spray, go in long sleeved t-shirts and long pants if you do not do well with bugs. Otherwise dress however you want. Any kind of shoes work in this garden. Have your small camera, iPad or cell phone with you. Carry a hand held battery charger with you as the gardens are superb and you will want many photos. If you find the perfect plant and don’t want to stand or sit on a rock go to WalMart and buy a cheap collapsible chair. You can always donate it and leave it behind when you fly home. Also, if you choose where you want to paint first and last you can then work on getting to the falls area and catch a ride back to the shop and restaurant area. One way is $5 and round trip is $10. There also are family rates available. Koko Head is an old volcano that is dormant. There is just the garden there and a gardner that is invisible. The last time I was at Koko Head you checked in with a man at a table at the entrance and you checked out when you left. There was no indication that any kind of help was available. I don’t know if the cell phone works well or at all at KoKo Head. It is a long, hot dusty walk to the Hawaiian section, which is at the farthest point in the garden. Tackle this garden aggressively, but travel light. A small backpack with sketch pad, watercolor pencils and a water brush would be adequate. Be sure to take a bottle of water for you and your assistant. When you finally arrive at the Hawaiian Section, find your specimen, photograph your choices, and sketch and make color swatches. 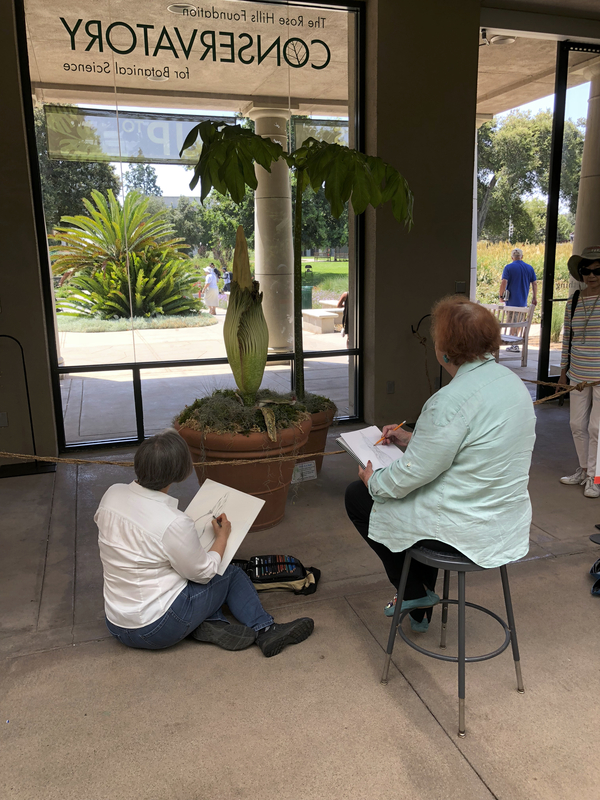 You can make notes about the plant from the ID labels that are below the plant. 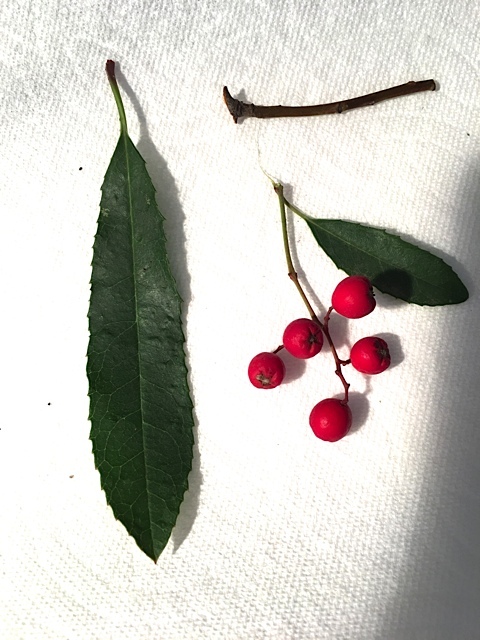 A red ID tag means the plant is endangered; a green/blue ID tag means it is not. Photograph the label so you have the information you need later. The last time I was at Koko Head the garden was very young. I am sure you will find some nice growth there now. It is difficult to get to the plants at Koko Head, and there is no one to assist you. It would be difficult to work there alone. I fell down a small hillside in very soft dirt about 25 feet. I guess I could have been hurt but I wasn’t. However, a sprained ankle would have made it hard to walk a long way to your car. Small camera, cell phone, iPad, small portable charger. Sketch book, such as a Bee or Stillman & Birn, Mixed Media (both can accept watercolor). Paper, 8-1/2 x 11 or smaller. Arches or Fabriano 300 lb watercolor paper can be bound into a book at Fed Ex or at an office supply store. These can be used for plein air studies in the field or in your hotel room/with photos from your iPad or cell phone. Ruler, tape measure, water bottle, water brushes and three to four good watercolor brushes. Pens that have their own ink supply (such as Copic, Zig or Micron). Small travel palette. Know the paint that you have in the palette. You can always shop for more paint at your destination. I have two great art supply stores that I go to in Honolulu. I have tried colored pencils. I find they break and you need a good sharpener. I like watercolor pencils because you can translate that color to real watercolor paint. Tombow markers with brushes. They are very strong colors but I have found them to be fun to do quick sketches and to work with on the plane. They don’t cause any problems. I carry 12 – 15 in a plastic box. A small folding chair. These can be found at Wal-Mart, Rite Aid, Daiso, sporting/camping stores, any variety stores, or online. Lightweight backpack. They sell some very nice lightweight backpacks in Honolulu. I bought a large one and a small-sized one made by Hawaii Island Spirit. I see them for sale in many places. If you plan on doing rugged hiking bring your own. It is not easy to work in a new environment with no desk, chairs, lighting or bathrooms. It is difficult to balance everything like paint, brush, water and paper when you are outside and the nearest place to put anything is the ground. It also is dark in some gardens, and is hard to find what you are looking for if you have been directed to a particular plant. It can be wet and muddy. Alpinia zerumbet. Shell ginger. Lyon Arboretum, Manoa Valley, Honolulu, HI. Photographer: Arillyn Moran-Lawrence, © 2017. You need a lot of things to make life productive so make sure you test things at home to see if they work for you. Get overly organized. Keep things light and manageable. If you have a collapsible chair, that is an advantage. If not, see if someone can lend you a TALL bucket. Having someone to help you is advisable. You can always contact an Art Academy or High School and see if they have a list of students who want to make some extra money. Pay them well so that they will want to really assist you.